When I was young I got the album to a new musical in New York—Godspell. At the time I about as far away from the big city lights as a girl can get. But I fell in love with the music and the message. And played that album (cassette if we want to be technical) over and over and over. And finally, got to see a performance in Oklahoma City as well as the movie version with a very young Victor Garber (who’d I’d see some thirty years later on Broadway last year in Present Laughter). The words and music are literally etched upon my heart. 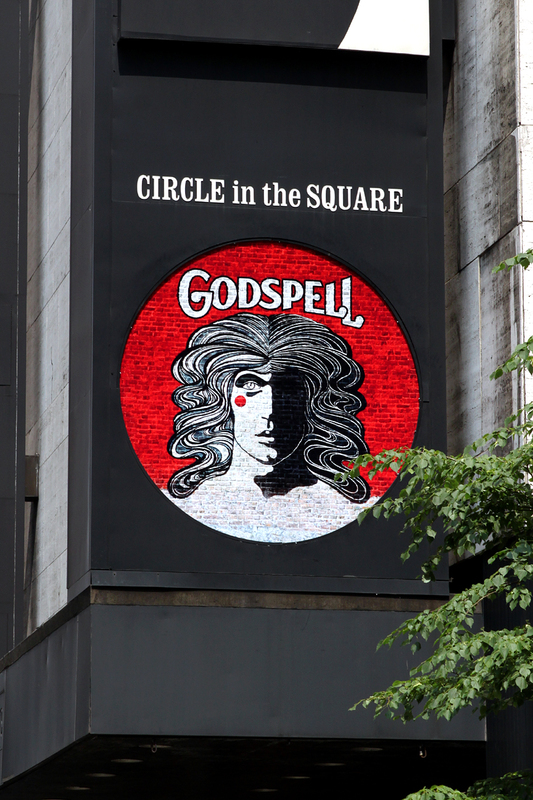 So it was with great anticipation that I went to the Circle on the Square (where I fell in love with The Putnam County Spelling Bee and Jesse Tyler Ferguson) to see the newest incarnation of Godspell. And while I had a lovely evening and totally enjoyed my blast from the past, I’m afraid I can’t tell you that the new and supposedly improved version lived up to my expectations. Anyway, for me in many ways, Godspell, was a spiritual awakening. And I not only knew all the words to all the songs, I could perform most of them on my guitar and quite often did (I still have the sheet music in my closet). I grew up with the advent of folk masses and the initial movement of more popular music sharing space with standard (and quite beautiful) hymns and liturgical music. It was new and exciting. And the music from Godspell played a role in all of that. So heading out for Circle on the Square I was ready to be taken back. To a more innocent time in my life when the music and movement were fresh. And to be fair, in certain moments, I still felt the magic. But a lot of the time I felt like I’d wandered in to a Gleeified (and I’m a Gleek, or at least I was until this season) version of my show. The opening, while definitely attuned to a modern world, seemed out of place somehow with the rest of the show. As did a lot of the modern day references (although I did laugh at several and the cast’s ability to mimic certain personalities was certainly up to Saturday Night Live standards) which seemed to overshadow the message at certain points. In fact, that would be my most overriding critique—the message was lost amidst attempts to modernize. The power, except in a few places, was diluted so that the heart of the piece was lost amidst the constantly moving patter. As I said, there were exceptions. And they were powerful. Lindsey Mendez, singing Oh Bless the Lord My Soul, was absolutely flawless. She not only has an amazing singing voice but a magnificent stage presence. And Telly Leung’s version of All Good Gifts was simply spell-binding. (One of the best moments of the night was a revival of Learn Your Lessons Well, with a little bit of Pippin thrown in for good measure, just before the beginning of the second act, with Leung on piano singing with Mendez.) Uzo Aduba gave a much more earthy delivery to By My Side, the result giving it more depth than the original (and as it’s one of my favorite songs, that actually is saying a lot). Wallace Smith, playing both John the Baptist and Judas was more of a mixed bag. His opening Prepare Ye gave me goose bumps, his voice powerful and sure. And the setting with the baptismal “river” was wonderful. But I never really felt his indecision and pain in betraying Jesus and since that is the pivotal moment between the light-hearted beginning and the dark turn of the ending—it’s a crucial note to hit. Day by Day, sung by Anna Maria Perez de Tagle, was lost in the choreography and business of the staging. What is a moving and simple song became overrun by too many other things, although Ms. Parez de Tagle was charming. Julia Mattison, coming in as an understudy, was also good singing Turn Back Oh Man, but again I just felt as if some of the power of the piece (the dichotomy between her vamp and Parrish’s wistful singing) was lacking. Which leaves us with Hunter Parrish playing Jesus. To be fair, I must say that both Stephen Nathan and Victor Garber played Jesus with soft spoken words and fly-away voices. So Parrish is following in the same vein. But the difference for me lies in the fact that both of the former cast members were able to make the transition from the soft-sung folksiness of God Save the People (re-orchestrated in the new version to its detriment, I might add) to the unbridled power of Alas for You. There is anger in the latter song. And we see Jesus as he begins to transform from gentle teacher to the man who will sacrifice all. And in Parrish’s version we never saw any of that. In fact, the musicians (placed amongst the audience) overwhelmed him at times. And without the power of that song, the second act felt flat. Costuming, by Miranda Hoffman, echoed the original (but without the clown face for Jesus), and overall it enhanced the performances rather than detracting. There was a funny bit in the opening where Parrish is choosing a shirt and rejecting, among other choices, the Superman T-shirt. Circle in the Square is a small theatre with seats surrounding the stage. It provides an intimacy that can’t be obtained on a standard Broadway stage. And a word should be said about the innovative staging, some that worked (the baptistery river), some that did not (trampolines?). Overall, I thought it was an innovative use of space, and never once did I feel as if I was behind the action so to speak. It was constantly on the move and mostly captivating. The newly added song Beautiful City fit seamlessly although the reprise at the end was frustrating for those of us used to the original and waiting for the reintroduction of Prepare Ye into Long Live God (it was there just muted by the addition of the new song). Overall, I think that the power of the musical was lost a little in the attempt to add modern patter and Twitteresque humor. But the cast was sparkling, with some of them out-singing, or at least equaling the originals. And I defy anyone not to feel their spirits rise as they’re reminded of the exuberance of youth and the power of believing. Godspell, Circle-on-the-Square Theatre, 1633 Broadway, (212) 239-6200, www.telecharge.com .